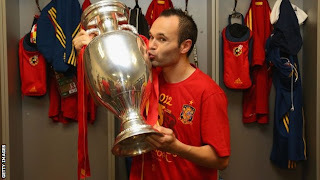 Spain midfielder Andres Iniesta has been named player of Euro 2012 by European football governing body, UEFA. The Barcelona player, 28, was selected by Uefa's technical committee after helping Spain beat Italy 4-0 in Sunday's final. Iniesta, who scored in the 1-0 win over Holland in the final of the 2010 World Cup, played every game for Spain in the tournament. He was named in the team of the tournament at the last World Cup as well as Euro 2008, where he played the entirety of Spain's 1-0 win over Germany in the final. "Picking Iniesta sends a message about creativity, incisive football and humility," Uefa technical director Andy Roxburgh said. Liverpool midfielder Gerrard and Sweden striker Zlatan Ibrahimovic were the only selections in the team of the tournament from sides that did not reach the semi-finals. Others to be recognised for their performances in Poland and Ukraine include Italy's Andrea Pirlo and Portugal winger Cristiano Ronaldo.